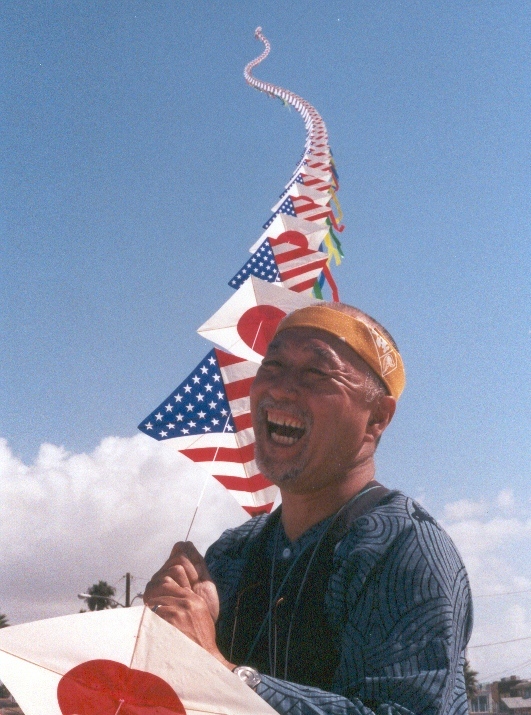 Japan America Society of Southern California - Meet & Greet with the Japanese Edo Style Kite Master Mikio Toki! Meet & Greet with the Japanese Edo Style Kite Master Mikio Toki! Let’s welcome the Japanese Kite Master – Mikio Toki! This will be a unique opportunity to learn more about the kite master’s work and history of Japanese Edo style kites. Born and raised in Tokyo, Toki been influenced and surrounded by Tokyo style kites since childhood. The kites Toki currently makes are Edo-Kaku-Dako, a rectangular kite with many long bridle lines and a hummer. He uses WASHI (handmade Japanese paper) and bamboo. The pictures are drawn by using Sumi, a black ink, and dyes, to create a stained glass effect when the kite is flown in the sky. A variety of his kites will be on display! At the event, guests will enjoy specialty dishes created by Mattel’s very own Executive Chef Dylan Regan. Chef Dylan has traveled to Japan to study Japanese cuisine, and will be showcasing various platters including traditional Japanese dishes and sushi! Beer, wine and sake will also be served. Kotobuki no Kai will be performing traditional Japanese folk dances at the event and a special photo booth will be available for you to take some fun pictures with the Kite Master! All proceeds from this event will support JASSC’s educational activities including HITACHI Japanese Kite Workshops held every fall, which benefits underserved elementary school students in the greater Los Angeles region. To-date, over 8,000 children have benefited from this program. To learn more about the workshops, visit the Hitachi Japanese Kite Workshops page. Buffet style dinner, beer, wine and sake is included. Pre-paid reservations required for security purposes. All guest names must be registered prior to the event. RSVP by October 18, 2013. Space is limited.